An uncommon and extremely attractive 1852 map of the Russian in Asia by Victor Levasseur. Covers the Russian empire in Asia from european Russia the Pacific and from the Arctic Circle south as far as the Chinese empire. Throughout, the map identifies various cities, towns, rivers and assortment of additional topographical details. Various governments' boundaries are marked. During this time in Russia, around 1825, Russian army officers, called the Decembrists, protested against Nicholas I's ascension to the throne. They were however defeated and some were exiled to Siberia. There, against all odds, the Decembrists thrived making significant contributions to the cultural and economic growth of Siberia. 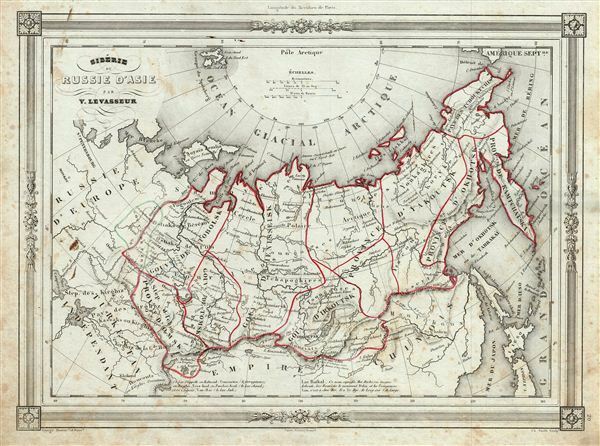 In 1856, when the Decembrists received amnesty, only some returned to european Russia. The map features a beautiful frame style border. Prepared by Victor Levasseur for publication as plate no. 20 in Maison Basset's 1852 edition of Atlas Illustre Destine a l'enseignement de la Geographie elementaire. Very good. Blank on verso. Minor foxing throughout. Small discoloration over the European part of Russia.